Hello. I enjoy having a podcast and I often see things or encounter things that have enough material that I can do an entire podcast about it. Many times though I come across something interesting or cool that simply isn't enough for a podcast. This month I'm starting a monthly podcast named "Bits and Bytes". These podcasts will be a variety of ideas or experiences in no particular order and some might not even have much of a tie to education, technology or history. Hotel Wireless - Super 8 rates 5 Stars! Circuit City Grand Opening - Is 2 hours of standing in line worth $50 to you? Zune - Potential for a classroom MP3 device. Do you have a Zune story? Don’t forget to sign up for the July 2007 book giveaway. I’m giving away copies of two books – Manhunt by James Swanson and Guerrilla Season by Pat Hughes. See Speaking of History Podcast #100 for more details. Just send me your name and the city in which you live before August 1, 2007. The first week of August my three year old daughter will draw two names and I will send them each the book they won. Hello. This past June a local news station ran a story about students using i-Pods to cheat. I told them about how MP3 players are also being used in classrooms to help students. They did a quick story on our use of studycasts in the 8th grade American history classroom. A studycast is an audio review for an upcoming test that I record and then post on the Internet for students to listen to at home or with their own personal MP3 players. The podcast today is the audio from the news story. There is also a shorter online text version of the news story here. Hello. Today's podcast is about a recent special edition of U.S. News and World Report magazine from July 2-9, 2007 which featured "Secrets of the Civil War" . I picked it up in the Atlanta airport on my way back from NECC. It is loaded with great features and would be an excellent classroom resource. In the podcast I discuss the variety of articles as a preview. I would encourage American history teachers to pick up a copy or check out the online edition of the special which includes many of the same articles and illustrations. Hello. A couple of weeks ago while in Philadelphia at the Constitution Center workshop I spend my last morning in the city eating breakfast with Ben Franklin. OK, maybe it wasn't the real Ben Franklin but this was a great experience. I would encourage anyone taking a trip to Philadelphia to check out the "Breakfast With Ben" offered at the Independence Visitor Center on the mall in between the National Constitution Center and Independence Hall. You are treated to a great breakfast, eat with "Ben Franklin" while he tells stories about his life and then can take a picture with Ben in the shadows of Independence Hall. You can call 1 800 537 7676 for more information. After eating breakfast with Ben, I walked across the street to Christ Church Burial Ground to the site of Ben Franklin's grave. It is a very interesting and historic place where 5 signers of the Declaration of Independence rest. If you have any comments please leave a comment on the blog or email me at speakingofhistory@gmail.com Also, don't forget you have until July 31, 2007 to e-mail me your name and city to be eligible to win a copy of Manhunt or Guerrilla Season - check out episode #100 for more details. Hello. My fascination with the topic of today's picture clearly demonstrates either: 1) I've been away from college dorm life for too long, 2) I'm very easily impressed, or 3) all of the above. Last month while staying at the dorms on the campus of Gettysburg College while attending a Gilder Lehrman Institute on Lincoln, I came across this sign in the laundry room. 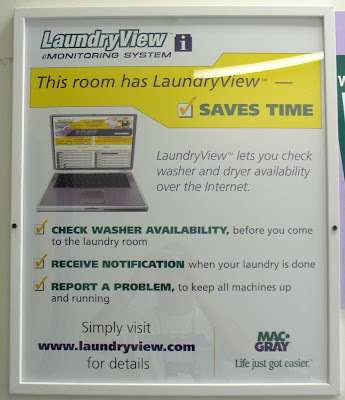 This is way too cool - you can log in and check on the status of your washing machine or how much time is left on the dryers? Wow. This would have saved me some considerable time in college as I would run down the steps of my dorm to see if I could use the person who was using the dryer had finished. The other cool thing about this laundry room, which I'm sure many campuses now have, is the ability to pay for the washing machine and the dryer using a campus credit card. Anyway, I thought it was pretty cool. Hello. It has been an awesome week of attending the NEH Landmarks Teacher Workshop in Philadelphia at the National Constitution Center. Today I interviewed Eli Lesser, Director of Education for the National Constitution Center. The NCC is a great please to visit and take your students but you can also find a wide variety of resources on their web site. I would also suggest checking out the teacher workshops available - you could be here next year enjoying the workshop I am currently attending. Don’t forget to sign up for the July 2007 book giveaway. I’m giving away copies of two books – Manhunt by James Swanson and Guerrilla Season by Pat Hughes. See Speaking of History Podcast #100 for more details. Just send me your name and the city in which you live before August 1, 2007. On August 1st my three year old daughter will draw two names and I will send them each the book they won. Hello. Today was the second full day of the NEH Landmark Workshop “A Revolution in Government” at the National Constitution Center in Philadelphia. It was a full day that started with a great lecture from Richard R. Beeman of the University of Pennsylvania. He discussed the start of the American Revolution through a different lens for me. The American colonists were already enjoyed many freedoms and yet they decided to fight a war with the most powerful nation in the world at the time to gain even more freedom. This is a topic that I would like to expand upon in later podcast. We also did a tour of Carpenter’s Hall, Independence Hall and the Graff House. Standing in the room where the Declaration of Independence and the Constitution were signed was an incredible feeling. I can remember reading about the chair with either the “setting sun” or the “rising sun” since I was in grade school so seeing it in person was a thrill. One of the great surprised for me today was a stroll through Washington Square and seeing the tomb of the Unknown Soldier for the American Revolutionary War and a statue of George Washington. In the evening some of us ventured over to Cuba Libre – an excellent restaurant that features Cuban food. It was excellent, music was festive and the ambiance was second to none. I would definitely suggest a visit to Cuba Libre on your trip to Philadelphia. I had the “Plato Cuba Libre” which is basically a sampling of featured Cuban foods. The workshop continues to be an excellent opportunity to learn more about the Revolutionary War and the Constitution. Don’t forget to sign up for the July 2007 book giveaway. I’m giving away copies of two books – Manhunt by James Swanson and Guerrilla Season by Pat Hughes. Just send me your name and the city in which you live before August 1, 2007. On August 1st my three year old daughter will draw two names and I will send them each the book they won. Hello. We started our NEH Landmark Workshop today in Philadelphia - "A Revolution in Government" with the National Constitution Center. Today we met the other participants - 40 teachers from all over the United States. We did a quick tour of the Constitution Center, a mini tour of Old City in downtown Philadelphia, a lecture from John Murrin of Princeton University and a presentation on creating classroom ready lesson plans by Eli Lesser, Director of Teacher Education for the National Constitution Center. The entire staff from the Constitution Center that we will be working with this week in fantastic - Eli Lesser, Laura Keenan and Patrick Spero. Tonight a group of us went to City Tavern - a historic eating establishment here in Philadelphia that sits on the exact location of the tavern where the Founding Fathers went to eat and drink after a hard day of debating and creating our Constitution. It was good food and even greater conversation about teaching history. It was a very full first day of the workshop and I think this group has a great energy that should make it a super week. Hello. Today was a free day in Philadelphia before the Constitution Center workshop begins on Monday. When I teach the American Revolution to my 8th graders I have always wondered what Valley Forge and the location of Washington's Crossing would look like in person. Today I was able to see both sites. Pat Hughes, the author of Guerrilla Season and a resident of Philadelphia, was nice enough to share the day with me and offered to drive - a huge relief to me who would have been lost about a dozen times on the way there had I driven! We wanted to see both locations so we didn't see everything at both locations, rather we saw the things we really wanted to see at each in a very busy day. The rest I'll see on my next trip to the Philadelphia area. Valley Forge was great and I have interviews with a couple of soldiers in the encampment. Then at Washington's headquarters I was blown away by the amazing living history portrayal of George Washington. This guy was awesome in appearance, voice, mannerisms, etc. - check out the photo. I did an interview with him and I swear I was visiting with ol' George himself! I also interviewed a slave that prepared the meals for George Washington and his staff at the headquarters. We finished up the day with a trip to Washington's Crossing State Park, including a tour of McConkey's Ferry Inn where Washington made the final plans for the crossing and attack on Trenton. A very full but exciting day. I look forward to returning some day with my family and taking time to soak in the entire site. The podcast is a little longer this time - a little over 50 minutes - but I think there is some great on site audio. Hello. Saturday was our last day at the Gilder Lehrman Institute on Lincoln located on the campus of Gettysburg College. Basically all we had to do on Saturday is eat breakfast and check out of the dorm rooms that had been our home for the past week. Earlier in the week Terry had mentioned that he wanted to get up early one morning and walk the location of Pickett’s Charge on the Gettysburg Battlefield – this was our last chance. Four of us – Terry, Chris, Steve and I – rustled ourselves out of bed early to reach the start of Pickett’s Charge at 6:00 AM. On the way to the battlefield Steve read the famous passage from Faulkner and it set the perfect mood. The sun was just starting the rise of the eastern horizon as we looked out over the open plain before us. It was perfect. The sun was poking through the top of the trees, a light and misty fog hung close to the ground. The only sound to break the pristine morning was that of songbirds in the trees, and that was a welcome interruption. Chris noted that if you listened carefully you could hear the morning drums of a nearby reenactment camp preparing for the large activity later in the later outside of Gettysburg. It was the kind of moment that you knew you would carry with you for a long time. After taking some pictures we set out to walk up the field before us just as the confederates had on that afternoon 144 years ago. We talked about what it must have been like on that hot afternoon and the placement of regiments and cannons. It’s almost as if there were no winners or losers here. The sacrifice for both sides was heavy and yet the outcome helped forge a nation dedicated to democracy we all benefit from today. It was a spiritual morning, my farewell to Gettysburg. Hello. Our work at the Lincoln institute on the campus continued on Wednesday and Thursday with some more excellent lectures and a field trip to the Evergreen Cemetery and Gettysburg Cemetery. The Evergreen Cemetery was already established at the time of the Battle of Gettysburg in 1863. We toured the cemetery and the Gatehouse - a famous historical landmark featured in many early photographs taken after the battle, including the few pictures remaining from Lincoln's Gettysburg Address. Listen to podcast for details of our tour of these Gettysburg cemeteries. Hello. Day 2 at the Gilder Lehrman Institute on Lincoln was a field trip to Washington DC. We loaded up the bus with the 30 or so teachers participating in the workshop and headed off to visit a few specific Lincoln sites in the nation’s capital. Sites included the White House, the Soldiers Home and Lincoln Memorial. The Soldiers Home was basically Lincoln’s summer White House and I plan to do a future podcast on this site, which will open to the public in February of 2008. I also ate an authentic Civil War era dinner at the Historic Farnsworth Inn in Gettysburg, picked up a few items to bring back to the classroom and walked through the cemetery at sunset. It was a full day to say the least. We also saw President Bush – sort of – and his entourage. Listen to the podcast for more details. You are welcome to leave a comment on the blog in the form of a comment or e-mail me at speakingofhistory@gmail.com. You can also register to win a book in the Listener Appreciation Give Away – see episode #100. Hello. Today’s podcast is a special July 4th podcast recorded at Gettysburg College as I attend the Gilder-Lehrman Institute on Lincoln. I took a little time off from the workshop to share a special memory that I have of the 4th of July. The podcast today is a story about my grandfather – Henry C Langhorst – as a German immigrant on July 4, 1923. I do think of fireworks and picnics on the 4th but my dad told me this story about grandpa when I was small and to this day it is the thing I think about when the July 4th comes study American History this July 4th in a place that was so critical to creating the America that he risked everything to live so many years ago. Hello. Today's podcast is about an incredible opportunity I had while here in Gettysburg at the Gilder Lerhman American History Institute on Lincoln. We listened to some amazing lectures on Lincoln and then in the afternoon had some time to visit the Gettysburg Battlefield site. It was extra special because Monday was the 144th anniversary of the battle. The day was beautiful - mid 70s with a blue sky and slight breeze. We sat on Little Roundtop at the exact time of day that the Union took the position. It was a spirtual experience. I discuss the day in this podcast. I have also included some of the pictures I took on the battlefield. You can subscribe directly to the Speaking of History podcast on i-Tunes here. Hello. Just a reminder - you have until July 11, 2007 to apply for the 2007 Microsoft Innovative Teachers Forum - held in Redmond, Washington on September 27-28, 2007. I have been selected to attend this forum the past two years and it is a great collection of teachers sharing ideas on education and technology. Unfortunately I will not be able to apply this year due to some other planned events in the family. Last year we had some great speakers and the group project I worked on visited the Pike Market and learned about how it runs as a community for our project. Discover more about the forum and check out the application here. Good luck. Hello. Today is a very special podcast for me - #100! I would have never imagined almost exactly two years in 2005 when I started this podcast that I would one day have 100 episodes. This is a a very short podcast but from a very historic site - Gettysburg. I am in Gettysburg for the week attending a Gilder Lehrman Institute of American History this week and taking an in depth look at Lincoln and Race. I will have more on what will be a very exciting and full week in Gettysburg but today I just wanted to say thank you to all that listen to this podcast. The topics vary greatly from show to show and often there is little reason to the topic selected other than it somehow relates to education, technology or history. Thanks for all the e-mails - I try to answer them all and am still working through a few. This podcast has been a sort of audio journal for me over the past couple of years and I thank you for going along with me. As a small, very small, token of my appreciation I will be giving away two great books to listeners of the Speaking of History podcast - Manhunt - The 12 Day Chase for Lincoln's Killer by James L. Swanson and an author autographed copy of Guerrilla Season by Pat Hughes. Manhunt is a favorite of mine and of course Guerrilla Season is the basis for our book blog project and I'll actually be visiting Pat next week when I'm in Philadelphia for a Constitution Center workshop. To enter the drawing all you need to do is send me an e-mail at speakingofhistory@gmail.com and include your name and city. I will accept all names and cities until August 1, 2007. On August 1st I will place each name on an index card, lay them all out on my living room floor and have my 3 year old daughter select two cards as the winners. I will then announce and contact the winners to obtain their mailing address so that I can send them their book. I have no idea how many people will send in their name but hey, if there aren't many names you have a great shot at winning a great book for free. Thanks again for listening to the podcast. I have a ton of fun doing it and I look forward to continuing the produce it. I hope to have some great episodes over the next two weeks from Gettysburg and Philadelphia.